Themed 'Making the Future', the Open Day hosted by City's Centre for Human-Computer Interaction Design (HCID) on 23rd April is hailed as a success. The Open Day, hosted by City's Centre for Human-Computer Interaction Design (HCID) on 23rd April, has been hailed as a success. The event, which attracted over 200 visitors, explored the theme 'Making the Future' and took place from 1pm to 9pm in the College Building. Sponsored by Saros Research, Spotless Interactive and Source, the Open Day saw a variety of talks from industry leaders in the media and technology sector and for the first time featured a Demo Room, giving visitors a feel for gadgets such as Google Glass (courtesy Pearson publishers) and the Oculus Rift virtual reality headset. 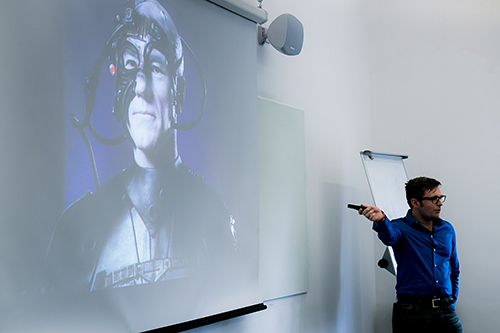 Among the stimulating talks featured throughout the Open Day were: "In interfaces we trust? End-user interactions with smart systems", by Senior Lecturer in HCID, Dr Simone Stumpf; "Designing out the screen", by Steve Taylor of The Alloy; and "From Participants to Pixels: Making the transition from UX Researcher to UX Designer", by Matt Radbourne of Foolproof. 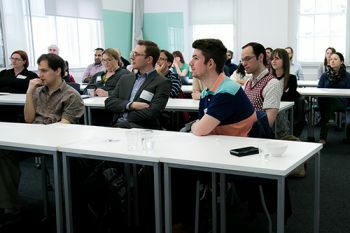 "I was delighted to deliver a keynote speech at this year's HCID Open Day, especially given the success of the event in recent years and the exposure it has given to the research and practice of human-computer interaction design at City which is impacting the world. 'Making the Future' was an excellent theme given the pervasive nature of the technological revolution and the increasing accessibility of various aspects of technology in transforming our communities." "We chose the theme 'Making the Future' because we wanted to inspire people. Most of us originally gravitated towards HCID because we wanted to explore the cutting edge of how people and technology interact - not just evaluate variations of what people have done before. This event was intended to ignite passion in this field of study and practice. I think we certainly accomplished this goal. The Open Day provided a great opportunity for people in the field of HCID and User Experience (UX), to network and expand their thinking. The Demo Room, which we trialled this year was also very successful. 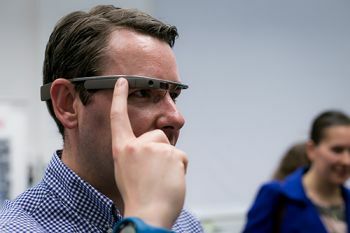 There was a positive atmosphere and the event demonstrated that City is at the forefront of research into the future of how people interact with technology".